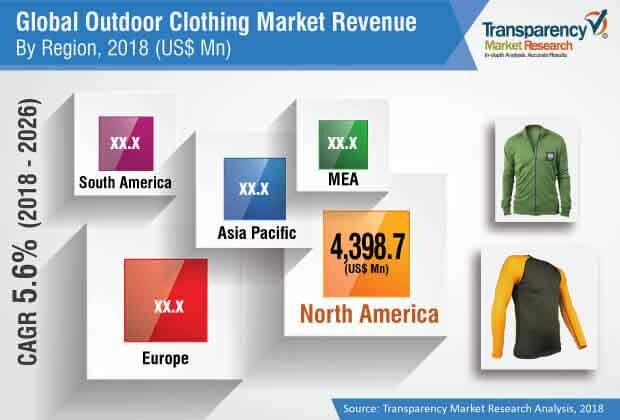 According to a new market report published by Transparency Market Research titled ‘Outdoor Clothing Market – Global Industry Analysis, Size, Share, Growth, Trends, and Forecast, 2018 – 2026, the global outdoor clothing market is expected to reach US$ 19,639.0 Mn by 2026, expanding at a CAGR of 5.6% from 2018 to 2026. In terms of volume, the market is expected to reach 325,873‘000 units by 2026, expanding at a CAGR of 5.4% from 2018 to 2026. In terms of region, North America held the highest market share in the global outdoor clothing market in 2017.The market is segmented by regions into North America, Europe, Asia Pacific, Middle East & Africa (MEA), and South America. In North America, the number of women buying outdoor clothing is more than men. North America has a favorable outdoor activities culture, which is increasing the participation of women in outdoor activities along with men.The men outdoor clothing market segment is growing at a faster rate than the women’s segment. This trend is expected to continue during the forecast period. Similar to North America, in Europe, the proportion of women buying outdoor clothing is more than men. Women’s participation in outdoor activities is increasing in Europe due to cultural factors and tradition. In Europe, the market for men’s outdoor clothing is growing at a faster rate due to increasing participation of men in outdoor activities. Going out for outdoor activities is part of European culture and this trend is expected to continue during the forecast period. As of July 2018, in Germany, the number of men (15-64+ years) and women (15-64+ years) are 34,194,533 and 35,939,222 respectively, holding 42.5% and 44.7% population share. In 2018, participation in outdoor activities in Germany is pegged at 15.2% which is expected to increase to 17.9% by 2023. Rising outdoor activities in Germany is increasing the demand for outdoor clothing products. Unlike the population trend in North America and Europe, in Asia Pacific the percentage of men as outdoor clothing consumers is more than women. Penetration of outdoor activities in Asia Pacific is low compared to developed countries due to culture and tradition. In this region, participation in outdoor activities means an escape to nature. Rising adoption of western lifestyle, increasing millennial population, and rising disposable income is increasing outdoor activity participation in Asia Pacific. The large population of youth and growing outdoor activity participation is increasing the demand for outdoor clothing in the region. In the Chinese outdoor clothing market, online sales have affected brick and mortar sales. Contrary to the fate of outdoor clothing department stores in the developed regions, Chinese department store sales are growing moderately. After the 2008 Olympic Games in Beijing, adoption of outdoor activities is increasing in China. Specialty outdoor clothing retailers such as Mountain Hardware and Lafuma have seen increase in sales. All these factors are increasing the demand for outdoor clothing products in China. In MEA, the men’s outdoor clothing segment is bigger than the women’s outdoor clothing segment and is expanding faster than the women’s segment due to rising participation of men in outdoor activities. In MEA, participation in outdoor activities is expected to increase from 8.4% in 2018 to 10.8% in 2023. In South America, participation in outdoor activities is increasing both among men and women consumers. Rising adoption of western lifestyle, increase in the number of millennial, and rising disposable income are increasing the demand for outdoor clothing products in the region. In Brazil, participation in outdoor activities is expected to increase from 7.7% in 2018 to 9.4% in 2023. Thus, rising popularity of outdoor activities is increasing the demand for outdoor clothing in South America. The study provides a conclusive view of the global outdoor clothing market by segmenting it in terms of product type, consumer group, and distribution channel. In terms of product type, the outdoor clothing market has been classified into top wear, bottom wear, and others. Top wear outdoor clothing products are further subcategorized into shirts & t-shirts and jackets & hoodies. Bottom wear outdoor clothing products are subcategorized into trousers, shorts, and leggings &tights. The others category includes hand wear, head wear, gloves, warmer, etc. Based on consumer group, the market is classified into men, women, and kids. Based on distribution channel, the market is segmented into online and offline. Offline outdoor clothing products distribution channel is further subcategorized into large format stores, specialty stores, and individual retailers.